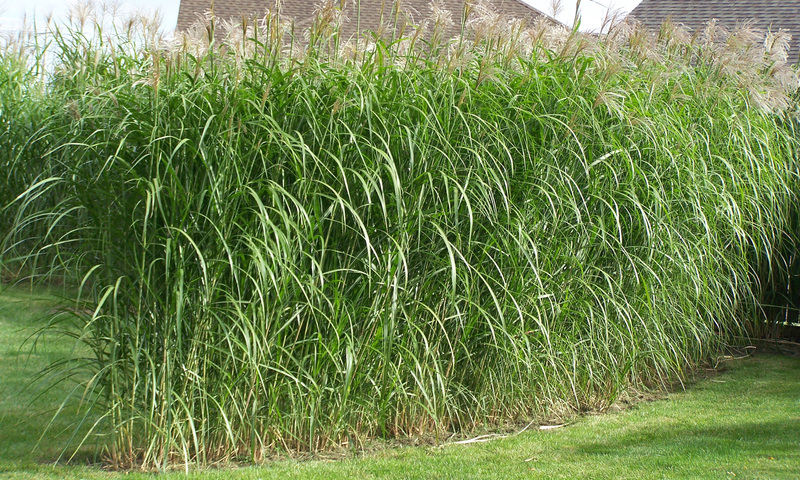 Silver Grass grows rapidly 6 to 7 feet the 1st year and is a great new way to build a totally natural privacy border for your property that is fast, quick and easy to grow. In three years you will be on your way to a totally private yard. This grass grows thicker and thicker every year. Deer will not eat this grass. Rabbits will not eat this grass. Nothing eats this grass. Silver Grass is a hybrid grass that will not spread or be invasive. It stays where you plant it and is very controllable. Silver grass grows rapidly and reaches 14 to 16 feet in height after it reaches maturity in three short years. The grass is drought resistant and requires little maintenance after it is established. It gets a beautiful plume in October that gives off a silver shimmer. It is a sterile plant and grows only from the rhizome so you do not need to worry about it spreading everywhere. After the second frost the plant will turn golden brown, but it will stay standing all winter for a great snow/wind break. In the early spring you can cut off the old grasses and within a few weeks your privacy border will be back in full glory. These rhizomes are only available for 6-8 weeks in the early spring, depending on the weather. Order now, supplies are very limited! 501+ rhizomes = Please call for pricing. NOTE: As a rule of thumb, we recommended that you order one rhizome per linear foot when making a border line. But you do not plant them that close. We ship our rhizomes via USPS Priority Mail to ensure they arrive timely and ready to plant. Shipping costs are shown below. Please contact us at any time with questions you may have or for assistance planning your order! Also, please see our Planting page to figure out how many rhizomes to order and how to plant silver grass for your project.